In Java, the word thread means two different things. An instance of Thread class. or, A thread of execution. An instance of Thread class is just an object, like any other object in java. But a thread of execution means an individual "lightweight" process that has its own call stack. 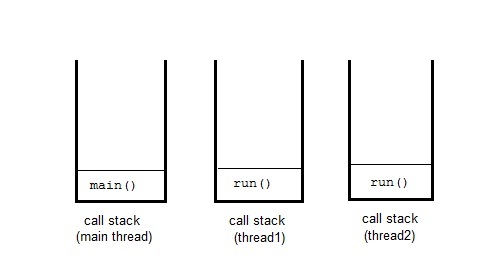 In java each thread has its own call stack. Even if you don't create any thread in your program, a thread called main thread is still created. Although the main thread is automatically created, you can control it by obtaining a reference to it by calling currentThread() method. It is the thread from which other threads will be produced. main thread must be always the last thread to finish execution. New : A thread begins its life cycle in the new state. It remains in this state until the start() method is called on it. Runable : After invocation of start() method on new thread, the thread becomes runable. 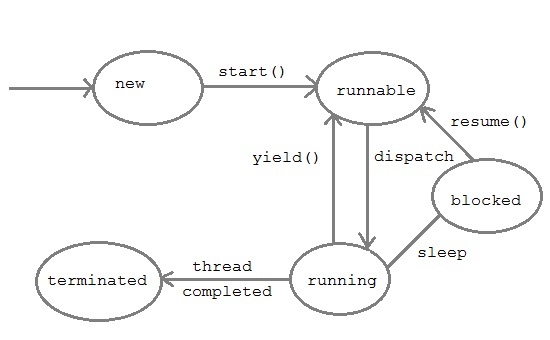 Running : A method is in running thread if the thread scheduler has selected it. Waiting : A thread is waiting for another thread to perform a task. In this stage the thread is still alive. Terminated : A thread enter the terminated state when it complete its task. By default every thread is given a NORM-PRIORITY(5). The main thread always have NORM-PRIORITY.